Rack-mount fiber optic distribution frame is modulated design with draw able trays inside and cold-rolled steel box. It could be pre-installed with various kinds of fiber optic adapters and pigtails. 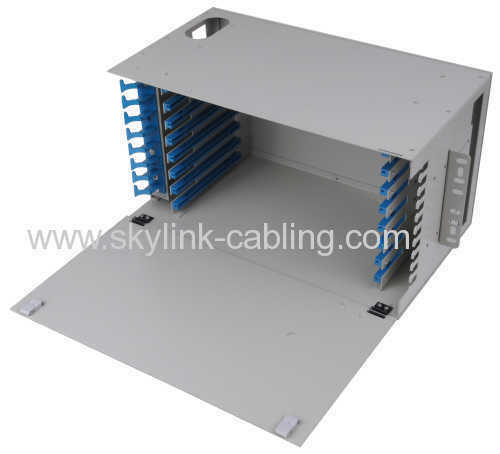 It is with standard 19 inch size and properly designed to control the bend radius of the cable inside the enclosure to avoid extra optical loss. Its front mark on the plates is easy for identification and operation. Height: 1U, 2U, 3U, 4U^.. according to cores. Weight (kg): according to cores. Capacity: 12 cores, 24 cores, 36 cores, 48 cores.